In the test environment, you can test using your real data without messing up your live production environment. Here you can add users, test course content, and/or troubleshoot issues without ruining the experience for your users. The test environment is overwritten with data from the production environment every three weeks. You can configure your test environment with production-ready features, such as access to your institution's login authentication system. If you want to keep up on the latest production features in Canvas, visit the Release Notes page in the Canvas Community. The test environment is separate from the beta environment, which is overwritten with data from the production environment every week and allows you to explore new features before they reach production. Learn more about the different Canvas environments. 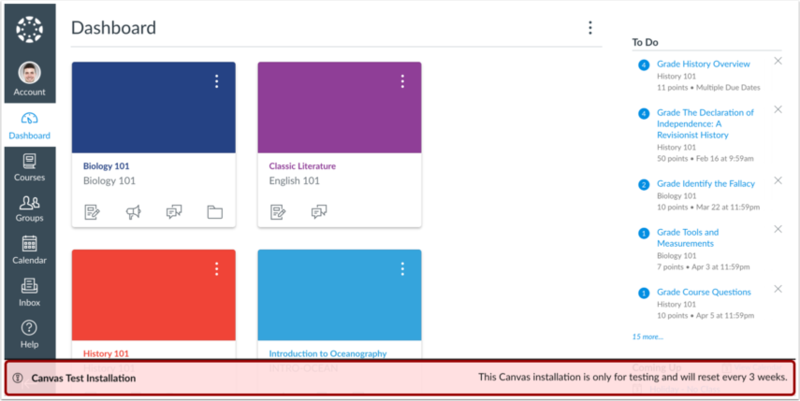 All users can access the Canvas test environment, but students cannot access course content beyond the Dashboard; if you want to allow students to view all course content, please contact your local Admin. Notifications, including course invitations and report downloads, cannot be sent in the test environment. Any changes you want to keep in the test environment must be made directly within the production environment in order to affect live data. Feature option settings are never copied from production and always retain their default settings. Feature options must be managed individually in the test environment. To log into your test environment, type [organization name].test.instructure.com into the URL field. Users in the test environment will see a pink bar across the bottom of the screen indicating the user is in a Canvas Test Installation. Test environments are reset every three weeks after the production release, and any changes you make in your test environment will be reset. If you want to save any course content created in your test environment, you can export your course. Note: To hide the pink bar across the bottom of your screen, double-click the Canvas Test Installation bar. Some new features may be released as opt-in only and will not appear until you enable them in your test environment. 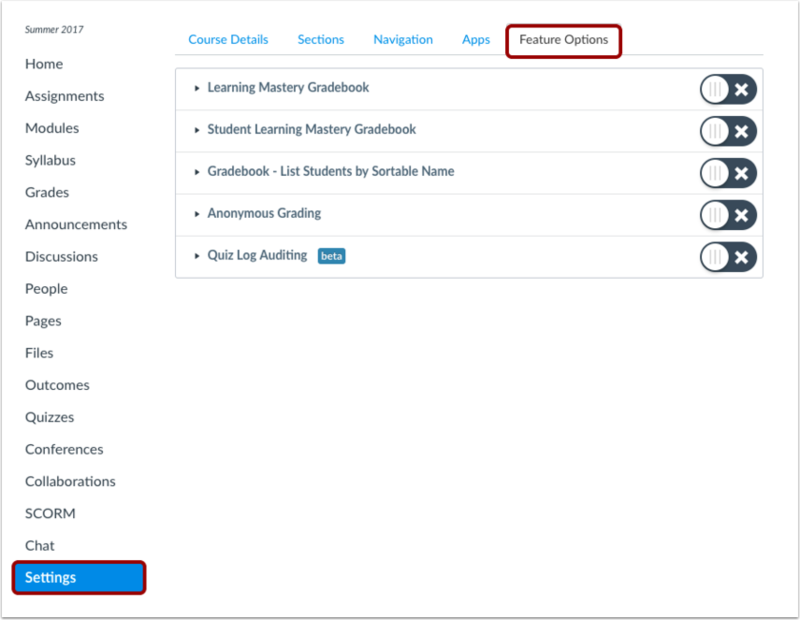 You can view these features in the Feature Options tab within Course Settings. Learn how to manage new features for an individual course. Previous Topic:How do I access the Canvas beta environment as an instructor? Next Topic:How do I get to SpeedGrader from an assignment, quiz, or graded discussion? Table of Contents > Settings > How do I access the Canvas test environment as an instructor?